First, Manchester United signed a new deal with yet another three-letter insurer that starts with an A - AON - in what is rumored to be a four year deal worth around $100 million. Some have questioned the merit of a largely business to business risk insurer buying into a deal that will generate a ton of consumer impressions - likely never to take the time to learn or care about what AON stands for. 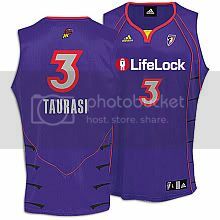 Next up the jersey sponsorship trend formally broke ground across the pond with identity theft company, Lifelock, announcing a $1 million jersey sponsorship with the WNBA's Phoenix Mercury in what is considered to be the first case of a major american pro sports team to sell their identity... errr, branding rights to the team's jersey. Lifelock, a company still trying to build awareness for their products and services, will benefit from exposure in arena, on TV and every time a Mercury fan coughs up $50 for a jersey. Finally, the Houston Chronicle reported yesterday that the NFL's Houston Texans are looking to line up companies to sponsor their pre-season practice jersey. At first blush, this is a relatively low visibility opportunity, but if you take into account the attendance some teams draw and the local media coverage including b-roll and player interviews that it garners, you can extrapolate the value. It will be interesting to hear about the price point teams are discussing for practice jersey deals. Will this be a first step to pre-season jersey sponsorship and then regular season? Jersey sponsorship, like naming rights, could generate significant ROI for companies looking to enhance brand awareness, but without activation, it won't do much to tell the brand's story. Some marketers won't care, others will. But hey.. at a time when clubs are bleeding cash, it makes sense to push the envelope (as we've seen not only through this, but also NFL's new Lottery rules). For teams facing an operating deficit, the idea of adding even a modest seven figure deal at virtually no incremental cost is pretty darn attractive. For marketers, everything is literally on the table. The question is - how will we use it?